Typhoons. A term dreaded by both producers and customers alike, due to its ability to cause huge production delays. At the time of writing, a huge typhoon, Typhoon Mangkhut, is approaching Hong Kong and China. This would certainly have a severe impact on production in the region. Standby (Signal 1): Used to signal any tropical cyclone within 800km of Hong Kong. Necessary precautions must be taken. Strong Wind (Signal 3): Definite warning given – Tropical cyclone expected to come near enough to Hong Kong to cause strong winds in Hong Kong. Gale or Storm (Signal 8): A warning of a gale or storm in one of the four quadrants (NW, SW, NE, SE). Increasing Gale or Storm (Signal 9): Indication given – Gale/storm expected to increase significantly in strength. Hurricane (Signal 10): Warning given – of hurricane force winds. Factory Closures: There are massive inconveniences to factories whenever a typhoon approaches or hits. Factory work is limited, as precautions have to be taken before the hurricane hits. Furthermore, everyone will have to stay indoors when the hurricane hits, which would halt all factory work. Transportation issues: Disruptions to transport usually occurs when hurricanes hit. Disruptions to land transportation can occur. Cancellations to domestic and international flights can occur, and closure of ports may happen. This halts or slows transportation of products. 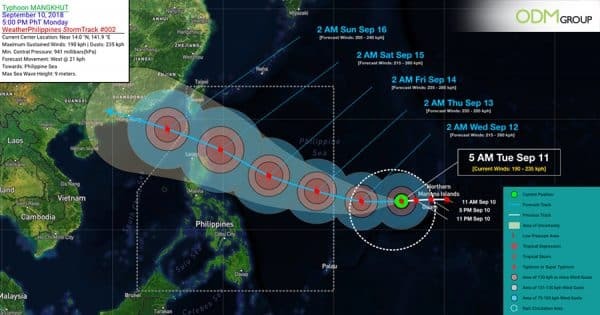 As such, based on the analysis above, typhoons have the potential to severely affect factory productivity and transport. This, in turn, could cause severe production delays. In particular, for this case, there could be a severe impact on production times in Hong Kong and Southern China. This would therefore affect projects concentrated within Hong Kong and Guangdong. In the past, there have also been several typhoons that have affected manufacturing in China and Hong Kong, such as Super Typhoon Hato and Typhoon Nesat. These typhoons have affected factories and offices in Zhuhai, Hong Kong, Macau, and South China. 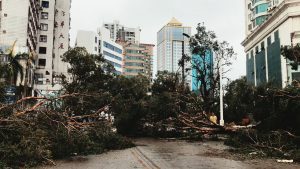 Here is a picture of the impact of the typhoon in Zhuhai. An article on how pollution inspections caused temporary closures for factories in Guangdong. Certainly relevant as typhoons cause pollution levels to rise just before they hit in Hong Kong. We hate that as much as we do the Typhoon! China’s national day holidays can change at a moment’s notice, give this article a read to check when the holiday week occurs. Some articles on how Golden Week in China affects production, certainly worth a read. An article on calculating shipping time, certainly effective in helping you check if you’re on schedule! Some articles on shipping delays, certainly frustrating. Here’s an article on how backlog can cause production delays! Some articles which certainly help to make production smoother! Here’s an article on how to effectively manage suppliers. An article on air freight. May be needed if there is too much production delay. High Air Freight Costs to Europe.